As Christian girls growing up, decision making is at every corner - and it can sometimes be hard to see how faith and 'normal life' can fit together, let alone how our faith can be at the centre of all we do. How can we live as Christian girls in all sorts of different contexts? Last month, we launched our new interview series: Faith Worked Out, to try and answer these questions through a series of interviews with women from all paths of life. Book on my bedside table: The Children Act by Ian McEwan. My coffee order is: Stronger. £10 treat: A pedometer to walk further every day & Badedas for a long soak in the bath afterwards. Why did you want to become a barrister and how did you work out what it is that God has put on your heart? What is the vision that He has given you for your life? I wanted to be an astronaut. I had to change to something else because I was told NASA would not be interested in a girl from Yorkshire. I loved arguing and trying to persuade someone else that they were wrong. I liked the fact that in law there are rules which have to be worked within but which give real opportunity for flair. I didn’t find it hard to work out what God had put on my heart, whenever I read the Bible it would be verses about justice and mercy that shone out. I didn’t start out with a plan or anything like a complete vision; I just wanted to be useful and do something really well. As doors opened for me in law, one after the other, I realised that this was interesting work that gave me a sense of God being pleased with my efforts and that there was a place for a woman of faith in the less salubrious parts of society as reflected in the work of the criminal courts. My vision is to be a complete woman; I want to be a blessing to my husband and children and to do my job in a way that brings honour to God. 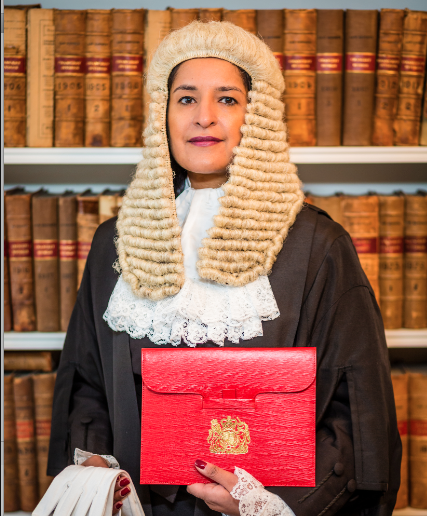 Most of my day is spent in court at the Old Bailey or other court, usually on my feet, arguing law, making speeches, calling witnesses or cross-examining defendants in murder or terrorism trials. I try to get out of the building for a few minutes at lunchtime for some fresh air. I often have meetings to advise on upcoming cases after the court day and there is always lots of preparation and advisory paper-work to do including sometimes last minute advices for the Attorney General about whether sentences passed in serious cases around the country should be appealed on the basis that they are unduly lenient. Because my own resources of patience, application, resilience and concentration are so limited I need God’s help all the time and so he is always right there, ready to help and I have no problem seeking his help. I can tell quite quickly when I have not been actively seeking God’s presence in my work and when that happens it is as if I need to throw myself into a deep swimming pool to be refreshed again. So I do (metaphorically speaking). Often in my role I am trying to expose the truth which is sometimes uncomfortable for people and I know that the tough approach necessary to do that may seem inconsistent with kindness and gentleness and other fruit of the Spirit, so I have to make sure that I am in the right place with God when I do that work because it is not at all inconsistent. There are many role models in the Bible: people who were strong in faith, active in society and not always popular, Queen Esther, Priscilla, Rahab, Daniel, David and many others. The fact that there are limits to what our court system can achieve is a challenge: at best we achieve human justice, at worse there may be injustice despite our best efforts. I cannot take the many vulnerable people involved in criminal cases either as witnesses, victims or defendants into my arms and show them that there is the possibility of healing and hope. I can only try to reflect God’s love through the way I treat them, the respect and honour I try to give wherever it is possible in the way that I speak to them and look at them. Don’t have a ‘to do’ list. Do stuff instead. Having your treasure in heaven means you can risk rejection from others and be fearless. We are all much more capable than we think. How can we be ambitious in our work in a way that honours God? Working hard, being honest, honouring others and lifting up the weak have their own reward. Private morality is reflected in public life and if we focus on worshipping God in our hearts and not people-pleasing then God will honour us. Ambition is not about diminishing other people. It is not easy. Sometimes it is very hard to keep ourselves pure. But it can be done; we have a wonderful model in Jesus. He was ambitious – he intended to save the entire human race even the billions not born. It is ambitious to seek to be the best that you can possibly be in the work you have been given to do however hard it is: the prayer in the Garden of Gethsemane is a prayer of absolute weakness but utter obedience. I don’t want to short-change God with the talents he has given me. I would rather end this life tonight, completely confident that I had lived it to the full, than hoard any part of my life in order to stretch it out. My best times with God are when I am working, in the heat of the job, when I am under pressure and needing to lean on Him. That is when faith really counts. It can be hard to get regular long periods of solitude with God in this present season in my life but I am pretty good at praying on the move and having a Bible App on my phone and iPad means I can be engrossed in Daniel’s adventures while sitting on a tube-train (sometimes missing my stop as a result). I use Nicky Gumbel’s Bible in One Year which is fantastic and always thought provoking. How would you encourage girls who are at a bit of a crossroads in their life, or about to face new challenges at school, university or work, and are looking to serve God passionately and whole-heartedly but unsure of the best way to do this? Ask yourself what do I really like to do? Then what am I best at? Next what skill or quality would I most like to develop in my life? God puts desires, talents and ambitions in us and so we need to learn to know ourselves and present ourselves to His examination. These questions tend to suggest the way ahead. Also ask an older woman you respect to pray with you and think about whether it will be constructive to make yourself accountable to her for a period. If you are really stuck, I would say always pick the option which gives you the most opportunity to serve others. We are so grateful to Bobbie for sharing her wisdom with us, and we hope her words encourage you to pursue God and bring Him honour in all you do. We're praying that you would be passionate about serving Him as your King.